During a YouTube interview with Sean Wright, David Crowley commented on Danny August Mason’s impartial approach of searching for the truth, “Like Danny said, that was the best thing he did, was taking that impartial approach to saying ‘Go do the research yourself,’ which is exactly what I did. And of course, once you go down that road you can’t come back.” David Crowley met Danny August Mason in 2010 and eventually the two created the story of Gray State. David Crowley then wrote the first version of the Gray State feature-length film. Mitch Heil “officially split ways from Gray State in mid/late 2013 or so,” but he still remained involved with David Crowley’s other businesses, Hot Head Productions and Bullet Exchange. “This wildly different view on life is what eventually broke off my relationship with the Gray State project,” wrote Heil. 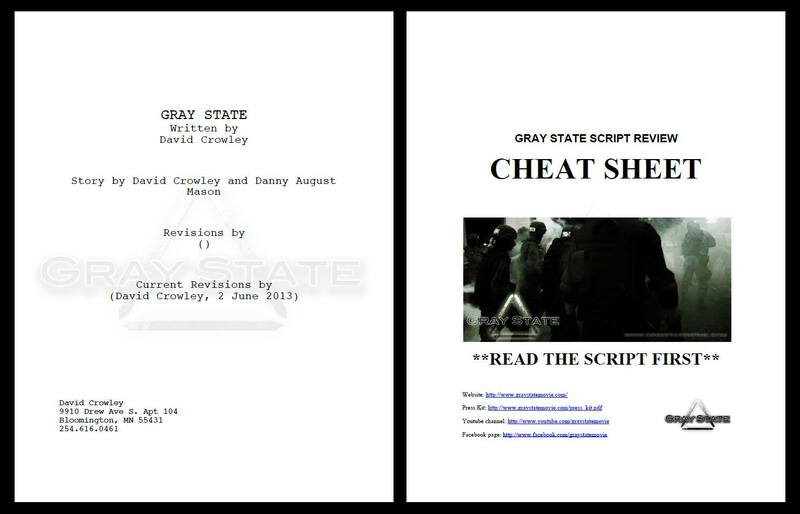 David Crowley completed a revised script of Gray State on June 2nd, 2013, and asked a select group of people to review the updated version of the story. Also in 2013, a rough cut of the documentary film Gray State: The Rise was given out to several people, including one of the hosts of The Rundown Live, Mike Paczesny. The movie script was steadily progressing on March 19th, 2014, “Today, in place of thousands of post-it notes,” David Crowley wrote on Facebook, “pages of scribbles, and 30 feet of plot-points, I have a 118-page script/outline hybrid that may be only days away from a solid draft 1. The original Gray State story took 8 months of solid work. This story took less than 2, and is better in every way.” On March 22nd, 2014, Komel was reading the first draft of the new Gray State script. On September 30th, 2014, David Crowley spent some time on Facebook answering questions from his supporters, “It seems like there are a lot of questions and expectations about this project. For the next 20 minutes or so I will answer your questions directly!” David Crowley wanted to give away his documentary, Gray State: The Rise for free, and today The Rise is available, free-of-charge. There are two very important posts from David Crowley that were either deleted or have been hidden from public view; one post was made on December 9th, 2014, and the other was dated September 30th, 2014. The missing post from September included a question by a supporter, as well as an answer by David Crowley (posting as Gray State). In this post, David Crowley mentioned his plans for “rebuilding a trustworthy team.” Asked what his biggest hold up was with the fictional movie, Crowley responded, “I’m doing this myself. I say “we” and “team” a lot, but when it comes to nuts and bolts work, writing, and leveraging the project into securing Hollywood money, it’s just me. I hope to change this by reinvigorating the process and rebuilding a trustworthy team.” We still do not know who removed or hid this post from the Gray State Facebook page, or why. Hopefully the post will reappear one day. September 30th, 2014, was a very important day, as David Crowley had big plans for 2015, “Today’s posts represent the first visible beginnings of the Gray State resurrection. I can’t get into too much too soon, but with the right amount of hard work, strategy, and miracle juice, the beginning of 2015 should see some amazing progress.” Crowley also wrote about a “new revamped website coming soon” and many of his last known conversations involved plans for the future of his projects. The questions kept coming, and David Crowley answered as many questions as possible within those dedicated twenty minutes. Crowley was attempting to reach out directly to his supporters and doubters, in order to address the criticism the project received for its multiple delays in production. During a 2012 interview with David Crowley and Danny Mason, host Alex Jones told the Gray State creators they didn’t need Hollywood’s help to make their film a success. So even if Hollywood wasn’t interested in his project, Crowley knew it was possible to make the film without their help, with only a small budget. Why would someone remove or hide this post from David Crowley’s Facebook account? Various screen-shots are all that remain of this post and several comments made the same day. Two people post comments in response. The first writes, “It’s taken a lot out of you I’m sure. The iron is hot, waiting for you to strike.” The second person to leave a comment is Sean, who writes, “You need to call me. I’m all good with getting out free intact. I brought that up initially. But if it’s released before my court you may send me to prison instead of beating my case. For real though David Crowley call me.” Sean also put his phone number in the comment. During a December 17th, 2014 email exchange with Los Angeles-based producer Jason Allen, obtained by the Pioneer Press, David Crowley relayed his plans for releasing the documentary film in a few weeks, “When you see The Rise, and the new trailers for the Gray State series, you’ll know what I mean when I say I have followed my heart at every step. I have no idea how much money is going to come together when this kicks off here in a few weeks, but it might be enough to get started on a series, then independent features running a common storyline.” David Crowley met with Jason Allen in Los Angeles some time in September of 2014 and was “very much excited about releasing this documentary,” according to what Allen said in the Pioneer Press news article. The email exchange also revealed the rising interest in the Gray State projects, “Gray State fans are growing at a rate of 100-200 per day even now,” wrote Crowley, “and when I get started I can only expect they’ll keep coming.” David asked Jason Allen to be an executive producer for Gray State, but before Allen could respond to the request, the deceased Crowley was already being accused of a double murder-suicide. At the same time David is allegedly distancing himself from family and select friends, Komel Crowley was helping her husband “build a database of professionals, actors and other industry contacts interested in the project,” according to Nick Ferraro’s Pioneer Press article. That was, possibly, David’s last post before he died, if in fact it was David Crowley posting as Gray State: The Rise at that time. In the comment section, someone asked when the Gray State movie would be released, Gray State: The Rise responds, “Make sure to follow this page, “Gray State” for updates on filming.” In a separate comment, Gray State: The Rise wrote, “And it’s not an easy feat when trying to maintain the stories integrity without selling out, and having such a small team.” Who was part of this small team at that time and who was not? Collin and Judy Prochnow lived next door to the Crowley family and had recently returned from an out-of-town visit when they noticed packages piling up near the front door of the Crowley home. A few days before the bodies were found, neighbors noticed the lights inside the Crowley house were on all day and all night. The curtains were wide-open, which was unusual according to neighbors. Mr. Prochnow said he had shoveled the snow in the Crowley’s driveway a few times, a common courtesy in Minnesota, because he hadn’t seen the Crowley family since before Christmas. Collin assumed the family was out of town. Mr. Prochnow also told local news media he heard a noise that sounded like a gunshot some time in December, but the actual date of the noise is unclear. On January 17th, 2015, Collin Prochnow rang the doorbell of the Crowley home and instantly heard the dog barking aggressively, but no one answered the door. So he peered through the front window. At first, Mr. Prochnow was not fully certain that what he saw through the Crowley’s front window were three deceased bodies. Initially, he told the Star Tribune, the bodies looked like dummies or mannequins, “To me, they just didn’t look human.” Mr. Prochnow then returned to his home and told his wife what he had seen. “He came home and said there were dummies [mannequins] on the floor,” Judy Prochnow said in the article. The Prochnows returned to the Crowley house and upon a second look into the front window, police were called to the scene. Another officer said, “We’re gonna make entry as soon as [inaudible] can get here and get this dog.” Based on the dispatch audio, the officer responsible for removing the dog from the house is told to go to the back of the house when he arrives. On January 18th, CapitalBay.com reported that police were calling the deaths “suspicious” but their article still revolved around the “apparent murder-suicide” theory given to them by police. Apple Valley Police Captain John Bermel was certain to tell the media there were no signs of forced entry or foul-play. “If there was a scuffle, you’d expect to find maybe something broken, maybe something knocked over. There was nothing like that,” Captain John Bermel told Nick Ferraro of the Pioneer Press. If that is true, then Captain Bermel should have no problem proving why his office told the media David Crowley was guilty within a day of finding the bodies at 1051 Ramsdell Drive. When I first wrote this article, the investigation was still on-going, so I believed Captain Bermel when he told KAAL, “We will establish a timeline and try to piece together what happened in that house.” Once the investigation was completed, I truly hoped his timeline would be available to the public. I was wrong. When police finally did close the case, they closed it quietly and refused to answer questions about their accusations against David Crowley. Thankfully, Apple Valley Police Detective Jim Gummert honored a promise he made to me before the case was closed. Gummert would eventually answer twenty-one questions about the alleged double-murder suicide. Paleo, the family dog, was found alive but had torn up part of a sectional couch in the living room. An alleged friend of David Crowley, someone posting as Mason Norsk Hest, told independent investigator Dan Hennen, “Paleo destroyed David’s body…David did try to kill the dog…body parts were all over the house. The dog left Rani’s body alone.” Yet Rani’s entire right arm and shoulder socket were missing? 1 Highly unlikely. Mason Hendricks told the Star Tribune about the note that David left behind, “It’s very short. It’s very puzzling. Honestly it doesn’t [explain what happened]. It doesn’t put much into perspective. It’s two sentences. That’s all it is.” There were two notes found in the Crowley home; one was a hand-written note found in the office bedroom and the other was a typed note on David’s computer in the kitchen. Neither note was signed by David, and there’s no reason to believe they are suicide notes, especially since they were found in two separate rooms. Anthony Antonello had his own suspicions, “I don’t want to jump right out there and yell, ‘conspiracy, conspiracy,’ but you gotta ask questions, man…things like this just stink, man.” Keep in mind that Anthony is just learning about what happened at the Crowley house as the show begins. As he’s speaking with Mike, he and his research partner are scouring the internet looking for any information related to the alleged double murder-suicide. On January 19th, 2015, the creators of the Justice for David Crowley of Gray State Facebook page and the Justice for David Crowley & Family Facebook group were both contacted by various people requesting administration rights. On the March 3rd, 2015 edition of Wake Up To The Truth with Mike Serour and Eric Wilkinson, Dan Hennen explained why he started the Justice for David Crowley & Family Facebook group, and then addressed the many requests for administration rights to his group. One of the people who wanted to become an admin for the Justice for David Crowley of Gray State Facebook page was Danny Mason. On January 20th, Danny Mason wrote to Thomas Lapp, the creator of the Justice for David Crowley of Gray State Facebook page, “Could the admin or admins please contact me?” Mason asked. Wagner then asked Dan, “Why aren’t you letting others be admins? Because you created the group? Mods are not the same as admins, you must know that.” To all the people who asked for administrative rights to the Justice for David Crowley & Family Facebook group, it’s never going to happen so go start your own group and quit trying to control that one. Shame on you. Also on January 21st, 2015, the Hennepin County Medical Examiner’s office labeled Komel and Rani’s deaths as homicides and David’s death as a suicide. All three died from a single gunshot wound to the head, according to the brief report. While David Kirk West clearly speculated that David Crowley might have “snapped,” he also asked everyone to refrain from jumping to the conclusion that the Crowley family was assassinated by the government. Of course we will consider any evidence that helps prove a double murder-suicide, and I hope Mr. West will consider the possibility that David Crowley is innocent based on the lack of evidence provided by police. Even more bizarre were Sean’s statements about David and Komel dying on their own terms, “Truth is David, Komel and Rani are dead. They died on their own terms…They did everything how they wanted to insure no one would stop them and so no friends or fam would find the bodies.” I asked if he was trying to tell me this was a double-suicide murder, but he never elaborated on that statement. Did Sean truly believe David and Komel decided to murder their child before killing themselves? If so, then why? Maybe Sean knew more than he could say. This was the first time I heard about the pact theory between David and Komel, but it would not be the last. The pact theory still exists today. A few days after contacting me on Facebook, Sean Wright called me, still trying to convince me to “free myself” from this case. Apparently, he didn’t have David Crowley’s phone number but he had mine, and I hadn’t talked to Sean in over a year or two. Even though I’ve never stated I believe David Crowley and his family were murdered by the government, Sean still felt it necessary to remind me that this wasn’t a government hit. Sean also told me “the property of Gray State was ours. It’s copyrighted. That’s why the videos keep getting pulled down, because we keep reporting it’s a copyright…you guys keep goin’ this route DHS and FBI’s gonna be on you. You don’t need that.” Again, I’m asked to “back off from it all.” Sean also told me he was probably one of the last people to see the Crowley family alive. All I asked for was evidence that David was guilty, but Sean could not provide any. He did tell me, “I’m just givin’ you a call out of respect to see if you could just free yourself in this situation before it gets worse.” Asking questions will not make the situation worse and that’s all I will continue to do until I find the facts that prove David Crowley killed his wife, his daughter, and himself. If police have enough evidence to tell family, friends and local media David Crowley was guilty, how long will it be until authorities tell the general public the details of their theory? I still do not understand why Sean would try and discourage me from asking simple questions about the alleged double murder-suicide. It makes no sense to me. The Gray Shame has been exposed from my point of view. It’s a shame that some people want me and other researchers to steer clear of any theory involving foul-play. I will consider the possibility that David Crowley is guilty and I will also consider the possibility that he is not. I will continue to let the facts guide me towards the truth. It was the responsibility of the Apple Valley Police Department to solve this case, based on facts. I believe they failed. “I know,” said Alex Jones, “and so was the prosecutor, and the President said it was a conspiracy theory, but now they admit he was murdered, the prosecutor. A lot of people are getting killed right now…they’re just murdering people.” It was such a shame Alex Jones chose to ignore this case. This case seems like a slam-dunk to reopen for so many reasons. I’m still shocked at the silence of the alternative media. What do they know that I don’t? Three months after the bodies were found, we were still waiting for any evidence to prove David Crowley was guilty as accused. The Apple Valley Police Department would not release any evidence or discuss the case with me as long as the investigation was still on-going. Sgt. Jim Gummert promised he would respond to my list of questions once the investigation was complete. One of the saddest turn of events throughout this case was the silence of many within the alternative media. I would like to personally thank Disaster Survival Magazine, 21st Century Wire, and the hosts of Wake Up To The Truth, Mike Serour and Eric Wilkinson for their continual interest and investigations into this case, and specifically for asking the questions that will help us all get to the truth. I would also like to thank everyone above ground and everyone underground who are following this case with an open-mind. We will find the facts. Police quietly released 464 crime scene photos and 94 pages of police reports before closing the case. The story continues in Gray Stage: David Crowley Police Reports and Images.